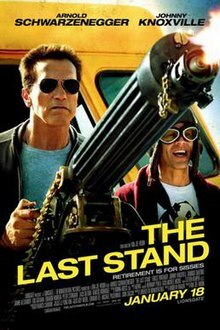 The Last Stand is as formulaic as they come and is strangely populated by 5 characters sporting near-incomprehensible accents: Arnold Schwarzenegger (born in Thal, Styria, Austria), as a retired LA narcotics detective who is the sheriff of a small town on the Mexican border; Forest Whittaker (born in Longview, Texas), as the out-of-breath, over-salivating, beleaguered FBI agent who has lost a major cartel figure in an attempt to transfer him from Las Vegas to a super max prison; Eduardo Noriega (born in Santander, Cantabria, Spain), as that cartel figure, who is hurtling at 200 MPH in a tricked-out sports car, hoping to make the border; Peter Stormare (born in Arbrå, Gävleborgs län, Sweden), Noriega’s henchman, who is clearing the path for Noriega’s arrival by trying to kill Schwarzenegger and his motley crew of small town defenders (Stormare’s southern accent is hilarious, half ABBA, half Foghorn Leghorn); and Rodrigo Santoro (born in Rio de Janeiro, Brazil), one of those defenders, an Iraq and Afghanistan war veteran locked up on a drunk and disorderly, deputized to assist Schwarzenegger. Since you can’t understand what most of the people are saying, the pedestrian script is mooted, leaving you free to enjoy director Kim Jee-Woon’s (born in Seoul, South Korea) impressive chase scenes and shoot ’em ups. I’ve seen worse, and Schwarzegger maintains an irrepressible likeability that makes for an enjoyable ride.